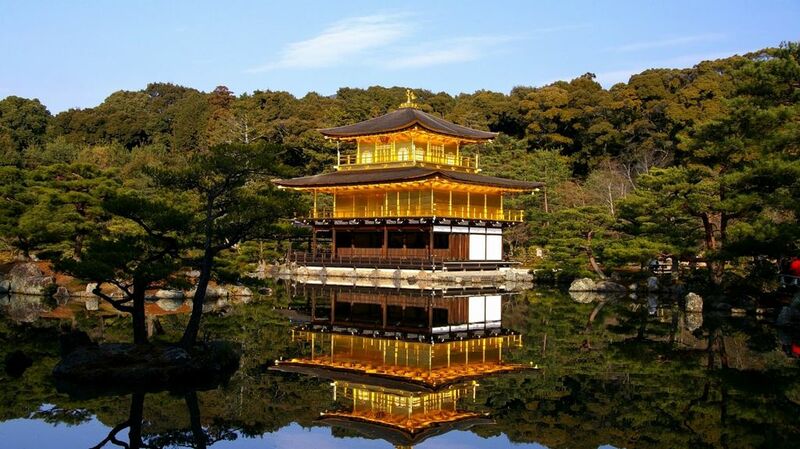 Kinkaku-ji (金閣寺, Golden Pavilion) is a Zen temple in northern Kyoto. This world cultural heritage pavilion’s top two floors are completely covered in gold leaf. The temple was built at the end of the 14th century originally as a villa for “Ashikaga Yoshimitsu”, the shogun at the time. After Yoshimitsu’s death, according to his will it became a Zen temple, which is famous for the practice of “zazen”, or religious meditation. The shining Kinkaku-ji is a symbol of Kyoto. It has burned down numerous times throughout its history. The present structure was rebuilt in 1955, and all of the gold leaf has been replaced in 1987. Kinkaku-ji was built to reflect the extravagant Kitayama culture that developed in the wealthy aristocratic circles of Kyoto during Yoshimitsu’s times. Each floor represents a different style of architecture. The first floor is built in the Shinden style used for palace buildings during the Heian Period. The second floor is built in the Bukke style used in samurai residences. And the third and uppermost floor is built in the style of a Chinese Zen Hall. Kinkaku-ji Temple is an impressive structure built overlooking a large pond called Kyoko-chi, 60,600 square meters and includes islands of various sizes such as Naka-jima and Iwa-jima. There are also rocks and stones of unusual shapes. These islands have different shapes depending on the angle from which they are seen. The scene viewed from the Sekka-tei Cottage at the back of the hill is particularly impressive. The reflection of the golden pavilion on the water is also striking. ← A Snowy Kyoto Experience!